Six players have been named to the 2018 Gatorade OHL Cup All-Star Team, a selection of the annual showcase’s top performers as chosen by OHL Central Scouting. 6 GP, 9G, 3A, 12 PTS. Toronto Marlboros forward Will Cuylle led all players with nine goals and 12 points at the 2018 OHL Cup powered by Under Armour. The 6-foot-3, 200Ib. forward’s showcase was highlighted by a pair of hat-tricks. Cuylle scored three goals in Toronto’s 6-2 win over the Sun County Panthers on Friday. He followed that up with another hat-trick on Saturday as the Marlboros defeated the Barrie Colts by a score of 3-2. The Toronto native had points in five of the Marlboros’ six games, helping them reach the semi-final and play to an overall record of 5-1-0. 7 GP, 5G, 5A, 10 PTS. Vaughan Kings forward Cole Perfetti finished tied for the team lead in scoring, recording five goals, five assists and 10 points in six games. The Whitby, Ont. native earned points in five of Vaughan’s six games, scoring the lone marker in a Championship Final loss to the Toronto Jr. Canadiens. 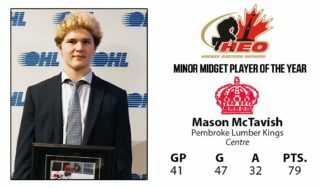 He posted multi-point totals on three separate occasions including a goal and two assists in a 9-1 win over the Peterborough Petes on Thursday, two helpers in a 4-1 win over the London Jr. Knights on Friday and a goal and an assist in Vaughan’s 3-1 semi-final win over the York-Simcoe Express on Saturday. 6 GP, 5G, 5A, 10 PTS. York-Simcoe Express forward Evan Vierling finished tied for third in tournament scoring, registering five goals, five assists and 10 points over six games. The Aurora, Ont. native had points in five of York-Simcoe’s contests, coming through in the clutch for a tournament-leading four game winning goals. Vierling scored the third period difference-maker in a 4-3 win over TPH Hockey on Thursday before stepping up for two goals and an assist in a 6-2 victory over the Mississauga Senators on Friday. Vierling emerged as the overtime hero in quarter-final action on Saturday, scoring the game winner in a 2-1 Express victory over the Oakville Rangers. Vierling won a tournament-high 63 face-offs, going 57.8% in the circle. 7 GP, 3G, 4A, 7 PTS. 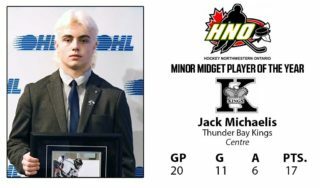 OHL Cup Champion Michael Bianconi of the Toronto Jr. Canadiens finished third among all defencemen with seven points including three goals and four assists over seven games. 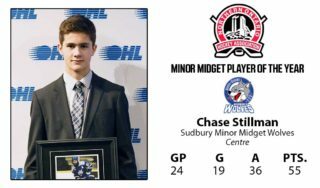 The Toronto native had points in six of the Jr. Canadiens’ seven contests and posted a plus-3 rating in a 5-1 Championship Final win over the Vaughan Kings on Monday. Bianconi lit the lamp in Saturday’s thrilling 3-2 overtime win over the Toronto Marlboros that put the Jr. Canadiens into the OHL Cup Final. He led all players in the showcase with a plus/minus rating of plus-15. 6 GP, 1G, 8A, 9 PTS. Toronto Marlboros rearguard Jamie Drysdale led all defencemen with nine points including a goal and eight assists over six games. 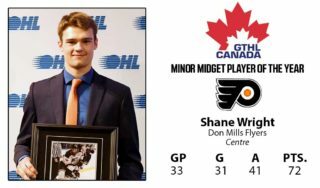 Toronto native had points in all six games he played, highlighting his week with a goal and an assist in a 5-3 win over the Guelph Gryphons on Wednesday. Drysdale had another multi-point showing with two assists in a 6-2 win over the Sun County Panthers on Friday. Drysdale and Marlboros teammate Lleyton Moore finished tied for the tournament lead in assists with eight. Vaughan Kings netminder Marco Costantini played the maximum 320 minutes, tending the Vaughan crease for every minute of the showcase while finishing among the showcase leaders with a 1.83 goals-against average, a .930 save percentage and an overall record of 5-1-1. Costantini stepped up in the playoff round, helping the Kings reach their first OHL Cup Championship Final with a 28-save performance in a 2-1 quarter-final defeat of the Mississauga Reps. 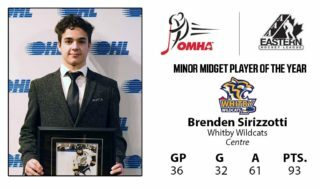 He was solid again later in the day on Saturday with a 27-save showing in a 3-1 semi-final victory over the York-Simcoe Express.